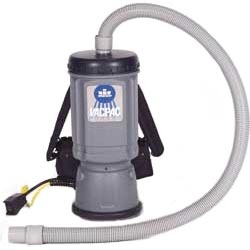 The Windsor Vac Pac 10 HEPA Backpack vacuum increases operator efficiency and productivity! Clean faster with more comfort. This 10 quart unit has a comfortable, lightweight harness system to make the job easier. Its quiet operation prevents disruptive cleaning. The power switch is conveniently located on the hip within easy reach and view for the operator.